Scheppach has been around for a long time and, over the last couple of years has improved the models within their range. The principal change is that all the machines now have cast tables. The 410 comes in about six boxes and is rather complex to fit up - you will need plenty of brain food and an extra pair of hands! The instruction book is not really any help at all and I found the layout difficult to comprehend. It took Anthony Bailey, our photographer, and I most of the day to set up. The planed cast table is good and is nicely substantial. The sliding table bar is heavy - you can just about lift it by yourself but watch your back! There are good-sized extension tables, a take off at the rear and a side extension which folds down neatly, ideal for those with a smallish workshop. The overall finish of this saw is very good and I have the feeling it will last the distance. The Scheppach is very smooth to use. The fence is pretty solid and has a fine adjuster, which did not work on ours. Although all the peripherals are mostly aluminium they are all very crisp and, for once, there are no complaints from this tester. Particularly good are the stops, which are superbly engineered. The tilt arbor is a little strange in that it is not geared and works via gravity - once the lock is released it is in freefall until you lock it off. It is a little strange if you are used to a geared tilt, but it does work. Also this saw has the facility to take a dado head, this is a technique that I have never taken to - I think it is inherently dangerous and it is much easier to do housings etc using a router. The sliding table is light and small and runs with roller bearings on an aluminium beam with round steel bars. 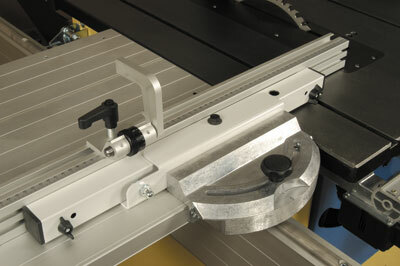 The crosscut action is good, accurate and will suit fine furniture work. The beam and table can all lift off it you want to pack it away for more space. This makes it very versatile for the home user. In essence this is a good saw; it's quiet and accurate. It works well as a saw and is well put together considering it is a kit of many parts. The tilt arbor takes a bit of getting used to, but it does work. The sliding table is well built, and for its type, smooth. 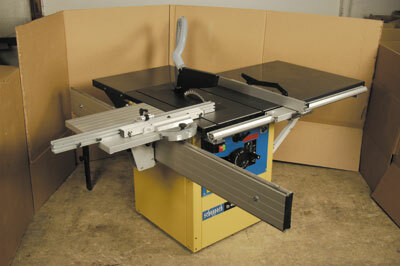 It is not big enough for a workshop which uses a large amount of panel products and is a little lightweight. I think it is a tad expensive when you consider its smaller brother the ts2500ci is only £1,263.85. It does have a smaller motor - 3.5hp as opposed to the 4.1 of this saw. 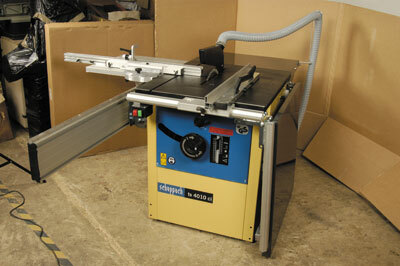 Either saw is good for a small cabinet shop or your first start-up saw both are worth considering if you are on a budget. 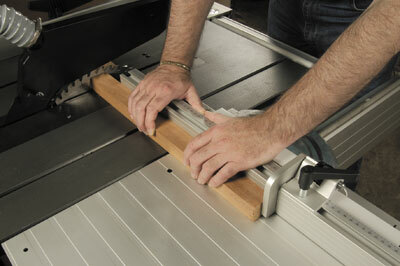 "The tilt arbor takes a bit of getting used to, but it does work"
Crosscutting - nice flip stops!